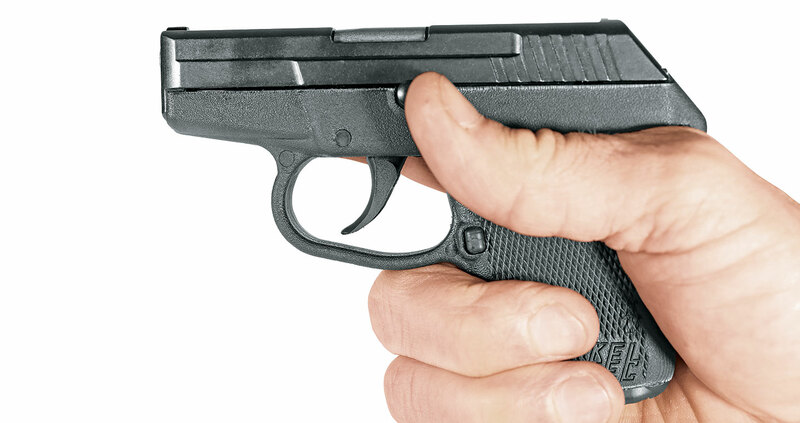 Kel-Tec’s P-32 in .32 auto is a small gun capable of handling big jobs. I have a confession to make. The guns I have carried have not always been chambered in “manly” cartridges. You know, the rounds whose designation starts with the numeral 4. Sometimes the weather, what I’m wearing or the need for ultimate concealment called for something smaller. When I was a gunsmith, I also counseled some of my customers to go with calibers that were smaller than what some “operators” might consider adequate. Not everyone can handle a magnum. Kel-Tec has an option for that: the P-32. For size, it is difficult to get something smaller. At less than seven ounces, just over five inches in its longest dimension and flat as a pancake, the Kel-Tec P-32 is in the same size league as a smartphone, and who complains about carrying one of those these days? When you can’t carry something bigger, then you can depend on the P-32. Really? A friend of mine with decades of experience, who has worked in the criminal justice system from top to bottom, packs a .32 every day. Granted, he uses it as his backup gun, but it is there every single day. The .32 ACP is not known for ballistic horsepower. However, it reaches farther than any knife and has more reach than the largest criminal. You use a firearm for defense because you don’t want to be punching, wrestling or otherwise dealing with the situation. You want to end a threat. There’s also the matter of strength. The P-32 discussed here is a locked-breech pistol. This means the recoil spring system, while strong enough to deal with the cartridge, is not as strong as that found on larger calibers—making it a good option for those with reduced hand strength. As I’ve noted before, our grandmothers are not generally able to pass a basic PT test, but does that mean they should not have the option to use a semiauto as their defense gun? And for those who can pass a PT test, as a second or even third gun, the P-32 is the perfect size to disappear into your wardrobe and not be noticed. The P-32 is as simple as it gets, with a nice double-action-only trigger pull, no thumb safety to fool with and just a mag release button as a control. The P-32 is not a striker-fired gun but rather a double-action-only, hammer-fired pistol, the hammer evident when you peer into the back of the slide. You shoot the gun like you would a snubbie revolver, which is as simple as it gets. The advantage is with the P-32 you get seven rounds to a typical snubbie’s five. The trigger pull is smooth along its entire path, and the force needed to work it is surprisingly light. It is also gratifyingly even, without the stacking that some designs saddle you with. It’s the kind of trigger you want on a gun so small. The chassis, the mechanical frame that holds the firing mechanism, is aluminum, machined from a billet of 7075-T6 alloy. It is pinned into the polymer shell with a pair of cross pins. The serial number is on the chassis—on the rear below the hammer slot, where it can be easily read. The frame is a shell, molded out of Dupont ST-8018 polymer. ST-8018 is a composition of Nylon 66 mixed with short glass fibers, producing impact resistance and rigidity that make it superb for this application. The Nylon 66 makes it possible to injection-mold the shells, and the resulting frame, once cured, is stable—meaning it is resistant to solvents and UV radiation, as well as thermally stable at any temperature at which a human could survive. The slide and barrel are 4140 steel. The barrel is left in the white, while the slide is given a durable black oxide finish. The barrel is heat-treated to a Rockwell C rating of 48, which is as hard as barrels you’ll find on full-size pistols like a 1911. At first glance you might think the P-32 is a striker-fired gun, but in fact it is hammer fired. It has an internal hammer block that prevents it from being fired unless the trigger is pulled. The firing pin is free-floating and is powered by the impact of the hammer. The gun also features a hammer block. When you release the trigger, the block moves into place to physically stop forward movement of the hammer toward the firing pin. The hammer block is moved out of the hammer’s path at the end of the trigger movement on firing. So, yes, the P-32 is drop safe because the hammer can’t touch the firing pin until your trigger finger gives it permission to do so. The extractor is a large, flat piece of spring steel, bolted to the slide by a Torx screw. Above its hook is an opening where you can see if there is a round in the chamber. The sights are admittedly small, machined out of the steel of the slide and not the easiest to work with. 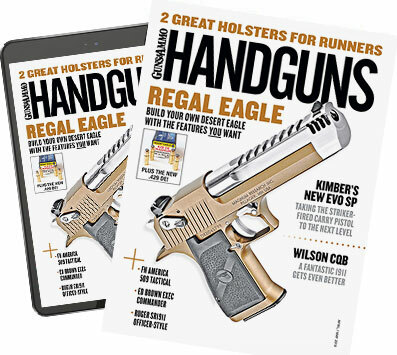 But the utility of a pocket .32 (and, please, use a holster—don’t just drop it into a pocket) is for close-range work, and there are ways to shoot effectively without overly worrying about sights. See the accompanying sidebar. 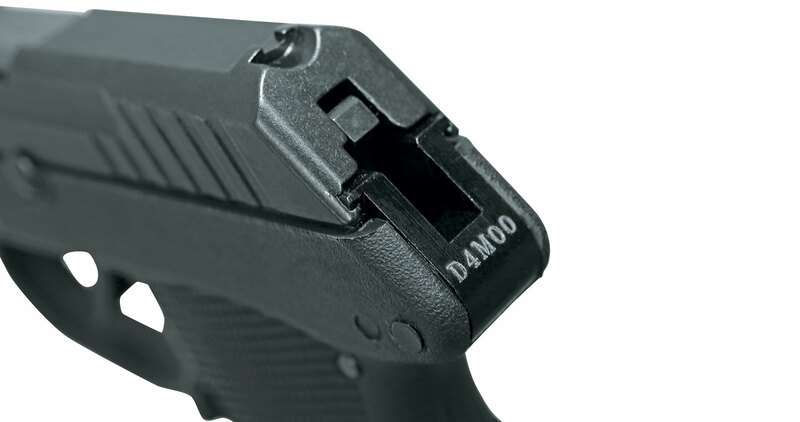 The Kel-Tec’s smooth, light DAO trigger helps produce hits, although the system doesn’t have restrike capability. If the round in the chamber happens to not want to get with the program, you’ll have to slingshot it out of there and continue with the next one. 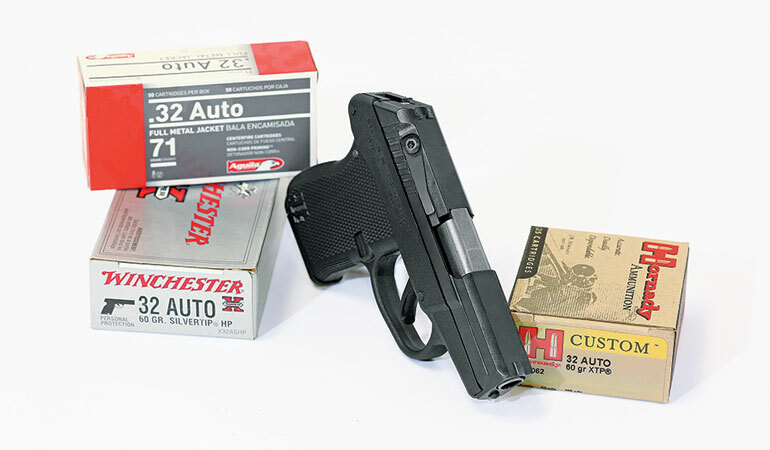 The magazine is a single-stack design that holds seven rounds of .32 ACP, but you can have more. Kel-Tec offers a one-round magazine extension base pad, and for those who want even more, there’s a 10-round magazine. The 10-round magazine features an extended base plate that surrounds the tube and acts as a frame extension. The effect is to have a P-32 with a longer frame for those who want more to hold on to. With the flush seven-round magazine installed, the P-32 won’t allow a full-finger firing grip for most people. The trade-off is excellent concealment. The P-32 does not have an external slide hold-open device, so the only way you can lock it open is by using an empty magazine to activate the internal hold-open. The gun will, of course, lock open after you’ve fired all the rounds you have available in the magazine. Reloading is easy. 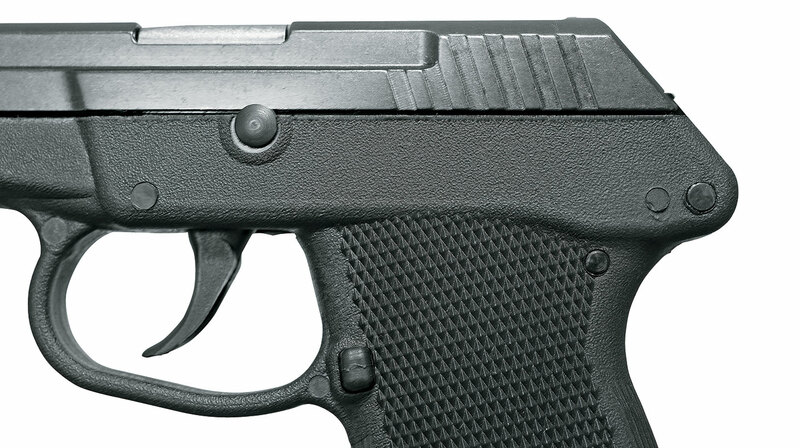 The frame has the standard magazine catch—a button—in the expected place on the left side behind the trigger guard. The disassembly process makes it a bit of a hassle to keep it clean, and if you do carry it in deep concealment or as a second or third gun, you’ll need to clean out the dust bunnies and lint critters every now and then. Fortunately, the P-32 doesn’t have a lot of openings where those potential clogging odds ‘n’ bobs can gain entry. I said it’s a bit of a hassle, but in reality takedown is easy once you get the feel for it. Make sure the pistol is unloaded and the magazine is out. Then insert an empty magazine and lock back the slide. With the slide to the rear, you have clearance on the side of the slide to get something under the edge of the disassembly pin head. A brass or stiff plastic tool will help prevent marring the slide. Pop the pin free of its internal spring, and once it is free you can push it out of the frame. With the pin out, remove the magazine, hold the slide, pull it back, then ease it forward. When it gets to the point where it would be when closed, dry-fire the pistol, and the slide will now come off of the frame. The process is a bit involved, but that’s the price of having such compactness. From there it is standard disassembly for cleaning. The recoil spring has a solid guide rod and two springs, one inside the other, to deal with the energy generated by the .32 ACP in such a small pistol. Remove the spring and barrel to scrub those parts. Hose the frame with an aerosol scrubber/cleaner and then lube the now-dry parts. Reassembly is easy, for the most part. Put the barrel back into the slide and the recoil spring assembly into the slide and barrel assembly. The hammer will be too far forward for the slide to deal with it. Use a fingertip to press the hammer back until you hear and feel a click. You can now run the slide onto the frame. Once the slide is fully onto the frame, insert the empty magazine again and retract the slide until it locks open. The last step is to use the disassembly pin to press the retaining spring down in the opening you see on the frame, and once clear of that, press the pin all the way home. Remove the magazine, close the slide, and you are ready to store it or load it up for daily carry. My range testing was interesting. Shooting groups was work due to the small sights, but the trigger is so easy to use that quick shooting was a snap. Just roll through the trigger, the P-32 goes “pop” in your hand (or hands) and then repeat for the rest of the magazine. I have large hands, and the regular magazine makes the P-32 small for me. I can get a finger and a half on the frame. The extended magazine base plate helps, but the extended one, with its 10-round capacity, is much better for shooting. That does lead to a conundrum. The smallest magazine is the easiest to conceal but the hardest to shoot. The larger magazine is easier to shoot but tough to conceal. In fact, by the time you get the P-32 and a 10-round magazine ready to carry, you are getting close to the size of pistols in bigger calibers. On the flip side, you get the easy-racking slide and the low recoil of the .32 cartridge with the P-32. It’s a choice only you can make. Not having a holster for the P-32, I shot the gun on a modified Bill Drill. From Low Ready at seven yards, I put seven shots into the A zone of a USPSA target in the test-limit two seconds with ease. The standard Bill Drill is six shots, from the draw, but since the P-32 magazine held seven, and the .32 is not as big as other cartridge, I figured a full magazine might be called for. There are some who feel that the expansion of the .32, if/when it happens, comes at too great a price of penetration. Those who feel that way opt for full-metal-jacket ammo. As an example, the Los Angeles Police Department mandated that all officers who carry .380s off-duty must load with FMJ ammo in order to ensure adequate penetration. I think I’d opt for FMJ as well. They won’t expand, but seven rounds of 71-grain bullets through the sternum is not likely to be shrugged off.